Industry 4.0, or the fourth industrial revolution if you will, is transforming the industry. By now everyone has heard about it or seen it at recent industry trade shows or their machine suppliers. 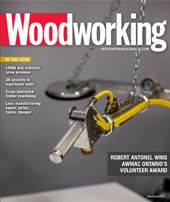 According to Sepp Gmeiner of Lignum Consulting, who is also a columnist with Woodworking Canada, the term was first used at Hannover Messe in 2011. Since then it has become ubiquitous in industry discussion that talk about modern manufacturing or the future of the industry. Industry 4.0 is here and it is here to stay and there is no going back, Gmeiner says. Exhibitors at AWFS Fair also showcased Industry 4.0 and the same will be true at WMS in Toronto later this fall. Gmeiner says the changes are not just dramatic, they are revolutionary. But just as it was with other technologies, the implementation of that technology can and will vary from company to company. “In its simplest and most basic form it’s like the example I used of my new printer. But Gmeiner also says that all of this will take time and will be implemented in stages. “You take the most advanced companies today and they are not really Industry 4.0, yet. They are still Industry 3.-something. But that’s OK, they are working on it. “It’s not unlike CNCs 30 years ago,” he says. “A few companies, the early adopters bought them first, but now just about everyone has them and it’s no longer a question. At Biesse Group, where they are having a banner year, Matt Fleming, vice president of sales, agrees and says Industry 4.0 will be a game changer when it comes to increasing production and efficiencies. 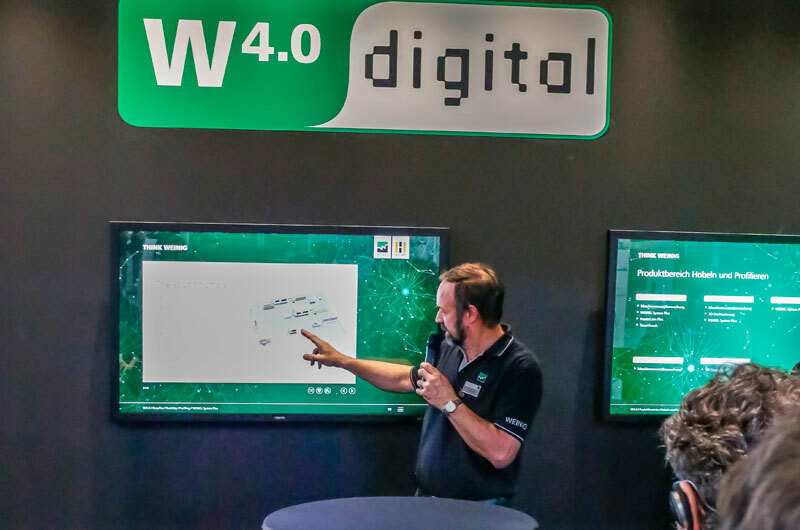 And while customers are not coming into the showroom specifically asking about Industry 4.0, Fleming says Biesse is ready and he considers it their responsibility to spread the word about the technology and processes. Citing the example of predictive maintenance, he says it is a new concept in the industry and it will take time, but eventually most shops will use it. “Right now if there is a problem, a break down, we log into their machine and fix it. 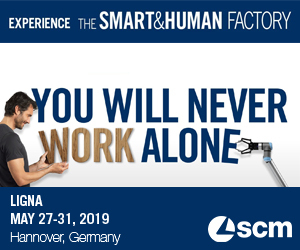 At LIGNA, Biesse Group introduced SOPHIA (Optimization Predictivity Human Innovation Analysis) a cloud-based software management tool that helps users achieve higher productivity by providing them with an easy-to-use dashboard containing real-time visibility of machine status, performance and functionality. Biesse Group in Canada has been growing with material handling and edgebander on and offloading equipment being among the biggest sellers right now. And to make sure customers get top notch service, Fleming says they have recently also added four service technicians. Richard Bluteau, president of SCM Group Canada says there is a lot of talk about and interest in robots and automation. 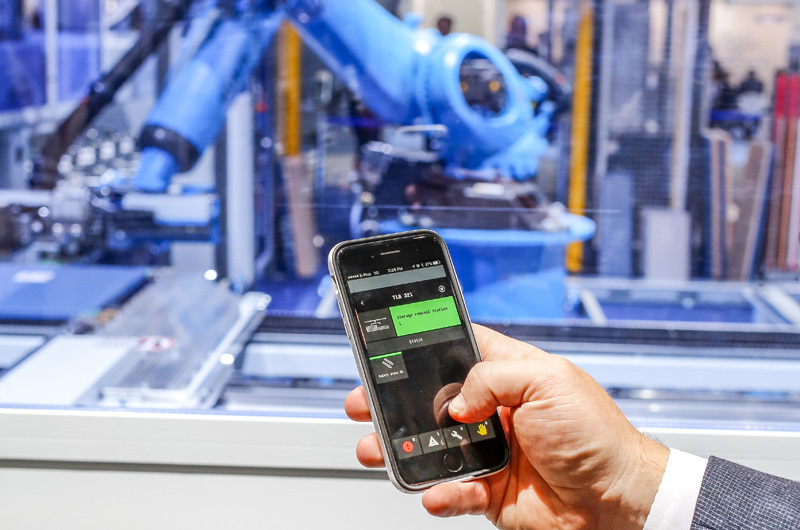 From being able to remotely monitor your machine from your smart phone to smart glasses and predictive maintenance, which improves machine productivity, Bluteau says all systems are going strong. “Customers will benefit from the technology. For example, they will be able to monitor their equipment and if there is a problem, rather than wait for a technician, they can put on the smart glasses right now and our service department can see what they see and talk them through troubleshooting. “There is a revolution going on in the Industry, Industry 4.0 and IoT (the Internet of Things), it’s all here and we are ready to help our customers with the implementation. HOMAG’s new digital platform for the industry, Tapio, had its world premier at LIGNA. Tapio combines digital products for the entire wood industry with thousands of production machines as well as a wide range of materials and tools in an IoT platform (IoT = Internet of Things). Tapio combines mechanical engineering know how, service, software and consulting for companies of all sizes worldwide in order to simplify work and increase productivity and quality. “We are just starting to implement this in Canada,” says Andreas Grabe, HOMAG Canada’s National Sales Manager. The information is sent to the cloud and shared as needed, it’s all done for you, all you have to do it connect your machine to the internet, he says. “As I said it is just starting here, but it is being very well received and we have a few companies in Quebec which are going full steam ahead with fully-automated, batch size 1 plants and more will be coming soon,” Grabe says. But he says many shops will start slowly, connect one machine and benefit from that and reap the financial rewards and then invest to connect the next machine and so on and so on. “Once they get started, people will see the benefits and the rewards and then they will want to do more of it. Industry 4.0 offers these kinds of improvements and we have the right tools to help them improve their business,” Grabe says.